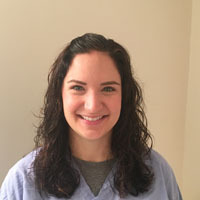 Emily Glass, PA-C is a certified physician assistant. An Indianapolis native, Emily graduated from Indiana University with a degree in biology before earning her master's in physician assistant studies from Butler University. Before beginning her family practice, Emily worked in emergency medicine for several years. She loves to learn and enjoys taking care of a wide variety of patients of all ages. When she is not working, she loves to spend time with her husband, daughter, and dog. She also enjoys watching her beloved Hoosiers in just about any sport.